Helping teens discover their true identity and most promising future. 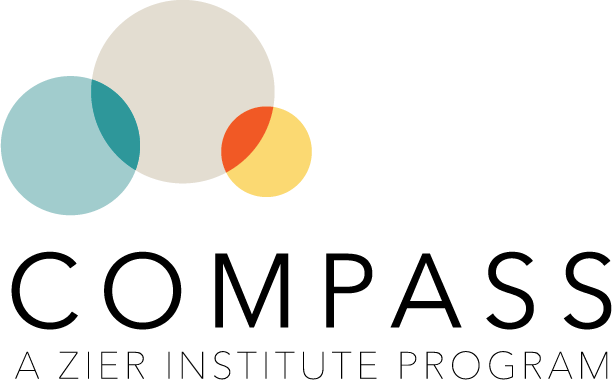 Welcome to COMPASS, a Zier Institute program that equips young adults with the internal tools they need to navigate this essential period in their lives – all in a safe, engaging environment. Focused on helping teenagers discover their best selves – young men and women who are confident, joyful and self-aware, capable of building and maintaining strong relationships. COMPASS is for teenagers in need of a safe and comfortable space to learn about themselves, face fears, increase confidence, and strengthen relationships. A 12-week program with one-to-one, two-to-one or three-to-one interaction options. The time will be spent on a series of questionnaires, exercises, journaling, self-reflection and discussions. We will engage the teen on their preferences, how the time is structured and what works for them — all with the goal of self-empowerment in mind. Our assessments, activities and tools support the teens in navigating the difficulties of junior high and high school in a non-judgmental and interactive way. Contact us today or fill out the form below. We’d be happy to speak with you.